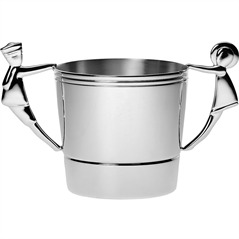 Playful Art Deco-style baby cup with inventive character handles. A perfect gift for girls and boys alike. In Christofle silver. Measures approximately 2 1/2" high. We like this posh baby cup because it's a nice and timeless gift to give to the little ones. This is the kind of cup the kids will have forever – they can pass it down to their nieces and nephews when they become Aunties!